It has been so much noise around Facebook lately and whose their next investor is going to be so that great small start-ups have naturally been overlooked. One of those is a tiny German based start-up called Jimdo. What is in common between Jimdo and Facebook, you may ask? There is nothing in common aside the fact that they have an investor in common – The Samwer Brothers. Just two months before they invested in Facebook with plans to take the company to Europe, the brothers have poured money into Jimdo through their European Founders Fund. The Samwer Brothers are Jimdo’s first large-scale investor. The amount of the investment is not publicly disclosed. Jimdo is an AJAX-based web pages creation tool similar to Google Page Creator, allowing users to create homepages completely over the Web, without any knowledge of HTML. Jimdo is perhaps most popular with the fact that you can easily grab a design from any site and apply to yours in a couple of steps. Jimdo is available in several major languages such as Deutsch, English, French, Chinese, Italian and Russian. Jimdo is really easy to use as the company’s web site claims. Once you’ve registered for your own JimdoFree-Page, they will immediately send you an e-mail with a link to your Page. After logging in to the admin mode, you’ll discover Jimdo’s greatest innovation: you practically won’t notice a difference between the site as it appears online and the site as it appears in admin mode! You can also integrate photos, videos, RSS feeds and downloads just as easily! Your visitors will immediately be able to see any changes that you make. After selling the German Internet auction site Alando.de to eBay for $50 million in shares, the brothers have made names for themselves and have become even more involved with startups since. After a brief spell working for eBay, they then set up ringtone firm Jamba, which they sold to the U.S. company Verisign for $273 million in shares and cash in 2004. Little later they have also invested in the German Twitter clone, Frazr, and a handful of other startups. Interestign fact to note is that the Samwer brothers also invested in the Facebook clone StudiVZ, which was sold about a year ago for $112 million. Taking these facts and achievements into consideration we would not be that far in our conclusions if we say the guys are successful serial entrepreneurs and they have something to do with the social networking, at least in Europe. It already comes as no surprise they are interested to bring the most popular social site into Europe and lock down exclusivity for the market. The Samwer brothers have become the strategic partners for Facebook in Europe. In 2006, they established the European Founders Fund to invest in promising Internet companies. In 2004 we founded NorthClick on an old farm. 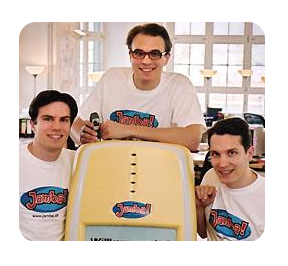 Without a cent we moved in at Fridtjof’s home and developed the online-software that now is the core of Jimdo. NorthClick distributes this software to small and medium sized enterprises who can use the software for updating their websites really easily. Short after the founding we won a business plan competition, which gave us approximately 20,000 USD. In combination with some basic agreements and our first customers we had enough money to move to Hamburg and rent our first office. Since then, we already moved into a bigger office and have a rising number of customers and colleagues! During the last four years more and more of our friends asked us whether they could use our system for private stuff. We were so fascinated by the cool pages they created! Some used the system for pages about themselves, three guys used it to document their sailing trip from Germany to Sydney, some to promote their bands… and the feedback was just unbelievable! That’s when the idea was born to give Pages to the People! 1979. Matthias has a diploma in business studies. He studied at the universities of Kiel, Germany and Goteborg, Sweden. In 2004, he was one of the founders of NorthClick, and of Jimdo in 2007. Almost every evening he puts up a good fight against Fridtjof and Christian (it’s all about being the best in Atomic Bomberman). 1983. Fridtjof and co-founder Christian founded his first company, web agency dream-up.de when they were still going to school. Later he founded NorthClick and Jimdo together with Christian and Matthias. At the moment, he practices handstand-running and furthermore he is innovator of the so-called “salary-golfing”. 1982. Christian founded with Fridtjof the web agency dream-up.de, later with Matthias and Fridtjof NorthClick and Jimdo. If Christian is not in the office, the noise level decreases at once!